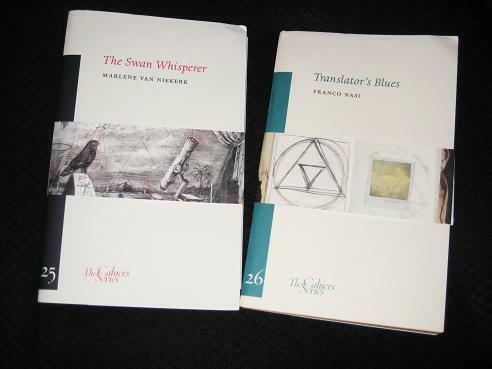 The first of today’s choices is Marlene Van Niekerk’s The Swan Whisperer (translated by the author and Marius Swart), a short story of sorts in the form of a lecture. In her talk, Professor Van Niekerk, whether a real version or a fictional equivalent, tells her audience about a former student of hers, a man she decides to call ‘Kasper Olwagen’. After arranging for the hapless Kasper to go on a writing retreat in Amsterdam, the professor receives a lengthy letter in which he talks about his experiences in the Dutch capital – one which Van Niekerk promptly shoves in a drawer and forgets. He straightened up, still murmuring, hands in the air like a conductor before the orchestra strikes up. Then he gave the first beat. And there, from under the bridge, swam two swans towards him, majestically, parading their necks, as if they belonged to him. The Swan Whisperer is an intriguing work, a text which swings between narrative and non-fiction, a little ambiguous in what it’s supposed to be. The writer deliberately distances us from the narrative, both through her sceptical attitude towards Kasper’s letter and her frequent returns to the language of her talk, addressing herself to her audience and at the same time dragging the reader away from Amsterdam. However, you sense that there’s a wider agenda here, with Van Niekerk (or her fictional alter-ego) gradually realising that there’s more to Kasper’s story than a cry for help from a homesick student. In a sense , she’s using the story to explore her own attitudes towards fiction, and how it should develop in South Africa. By the end of the tale, the shift from a cynical academic reading a letter in the comfort of her home to a writer pursuing a new form of text is complete. Van Niekerk, having received cassettes of undecipherable murmurings from her former student (who has disappeared into the South African wilderness), now spends her time translating what she hears into a mix of Afrikaans and babble. Is it all fiction? Is it based on reality? Does it really matter? There’s no such question of the metaphysical in the second piece, though, as Franco Nasi’s Translator’s Blues (translated by Dan Gunn) is a much more down-to-earth piece of writing. We plunge straight into Nasi’s musings, a meandering series of memories which, while seemingly random, are actually cleverly crafted, each idea flowing into the next, creating a picture of a comfortable, and comforting, existence. Nasi emphasises his roots in his native region of Italy, casually introducing us to the roads, hills and cemeteries (! ), claiming that this is where he was born and where he is likely to die. I woke up this morning, I went to the shops, and I found that on Sunday mornings it’s not possible to buy alcohol. ‘But this is non-alcoholic beer,’ I said to the cashier. I trudged home under the falling snow, my mind teeming with questions: Would the ban be in operation only on Sundays or on every other day too? Why should non-alcoholic beer be sold from the alcohol counter? Is non-alcoholic beer an oxymoron? Is this the case only at Dominick’s? And then, why before eleven? What happens in America after 11 a.m.? As much as Translator’s Blues is about the genial Nasi’s cultural experiences, however, it also looks at the perils of translation, with the title a clever nod to some of the anecdotes contained within. As well as examining the difficulties of the Blues, and its ‘translation’ of African musical scales to the Western equivalent, Nasi discusses how the word ‘blue’ is so prevalent in English, making it hard to translate when other languages use different colours for the same idea. I guess most of us have the opposite problem. I think things are better in the U.K. but here in the states it can be difficult to find translations. I keep my eye out, and I pick them up when I can. But I’m no where near the 3% mark you mention. James – It’s all about momentum – my efforts in translated fiction over the past few years have pushed me into a position where it’s easier to read translations than books written in English (I certainly know far more about that world too…). i’m way under 3% sadly…… it’s not easy getting translated works in UK book chains unless you happen to live in one of the mega cities like London. By the way what language was the Marlene Van Niekerk originally? I assume Afrikaans but could be wrong. Karen – Yes, it was from the Afrikaans (which I only realised when I started reading it! ).